When we bought Botley Hill Farmhouse, in 2015, we wanted to create an informal dining destination that appealed to regular visitors just as much as those looking to enjoy a special occasion. With that in mind, our dishes are the kind of things that not only tempt us daily but also still feel like a little treat. Our chefs serve food that can just as easily be enjoyed with a pint of your favourite beer or a G&T and a quick catch up with your friends and family, as a bottle of fine wine under candle light in a cosy corner for date night. We take our food and drink very seriously here at Botley Hill Farmhouse, without ever longing for the Michelin guide to cast its unremitting spotlight our way. Botley is a place to relax in the Surrey countryside with simply delicious food. While our fine wines come from around the world (and we have some incredible bottles on our list! ), we always aim to ensure the ingredients on your plate come from as close to our Surrey home as possible. For instance, our beef is sourced from Bill and lamb is from Will, both of whom farm right here on the Titsey Estate, only minutes away from our kitchen. A true taste of Surrey, then. Our venison and small whole wild duck, meanwhile, are brought in from the family run Chart Farm, which is just over the border in Sevenoaks, Kent. We also use Goosnargh Duck, of course, which comes from a little further afield but is utterly delicious. Authentic fresh pasta is handmade in London by La Tua, whose shop has been located in the heart of Borough Market since 2006. Delicious artisan bread is made for us by The Sussex Kitchen bakery, which is based in Uckfield. 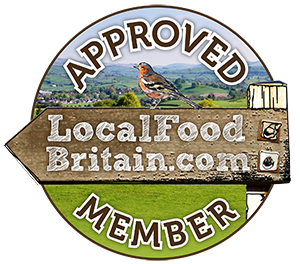 They produce the excellent rosemary focaccia, brown and white farmhouse loaves and sourdough loaves that you will have enjoyed with your meals recently. Even our cakes of the day, which you may have enjoyed recently, are baked by talented homebakers who live in the area. If you’ve ever partaken in our cheese board after your meal, you’ll have enjoyed Golden Cross from Whitesmith, East Sussex; Lord London by Alsop and Walker, which is made in Mayfield, East Sussex; Kentish Blue from Kingcott Dairy in Staplehurst, Kent; and Winterdale Shaw, which is made near Sevenoaks, Kent, and matured in special caves in the North Downs. At the heart of our bar offering is, of course, Titsey Brewing Co ale and lager, which is brewed on site by Craig Vroom. As many of you will already know, Craig recently ran a crowdfunding campaign and is now looking to expand his brewery in 2019. So watch this space for more of his fantastic beer. As for gins from Surrey and surrounding counties, well we’ve got you covered with Distillers of Surrey, Dockyard Gin from Chatham's Copper Rivet Distillery, Bathtub Gin from Tonbridge's Ableforth's, Brighton Gin and Greensand Ridge Distillery gin from Shipbourne. Take your pick for some refreshing sipping. For something non-alcoholic, our hot chocolate is always a winner. We use Cao, a beautiful handmade natural chocolate spread, made using organic raw cacao powder and Grade A maple syrup, which is produced just down the road in Dorking. A decadent treat that’s actually healthier than many other options! Win-win, we say. Whether you’re looking for a quick snack and cup of coffee in our Sheep Shed tea room or you’re longing for a full three-course meal with wine, you’ll find all of our menus online here. Of course, our chefs are always creating daily changing specials too, so keep an eye out for the blackboards. As regular visitors will know, it’s not just our menu that showcases local produce. Inside our quirky Sheep Shed, among the homewares and gift ideas, you’ll find some great food and drink items to takeaway with you from Botley. Try Briscoe’ Jellies for savoury fruit and herb jellies created in Merstham; enjoy chocolate from Forest Row’s Rowdy & Fancy’s; honey from Reigate Beekeepers’ Geoff Blay; and coffee, directly traded from Brazilian farmers but hand-roasted near Oxted, from Cafezinho. Make sure you pop your head in the door on your next visit. 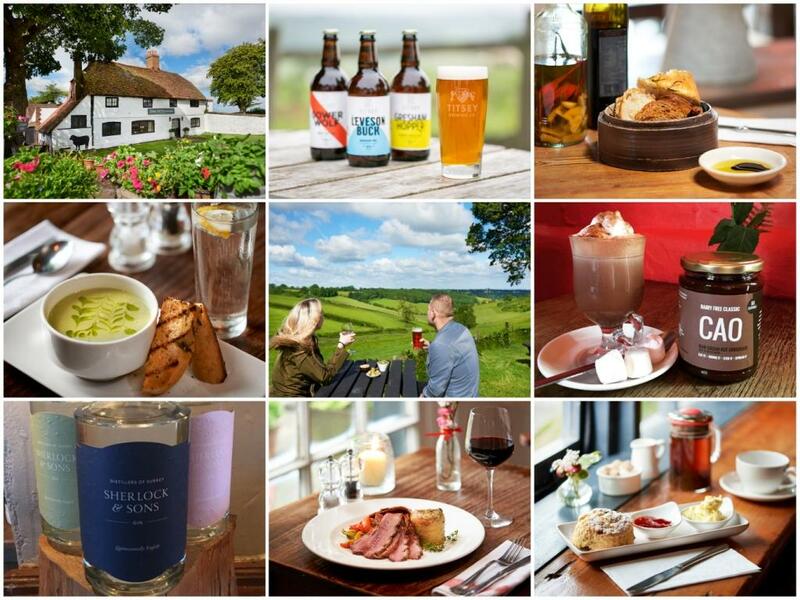 To see what all the fuss is about, make sure to request a table soon and visit us at Botley Hill Farmhouse for some fantastic food and drink, relaxing surroundings and, of course, our beautiful view which we think is one of the very best in Surrey. We look forward to welcoming you soon.